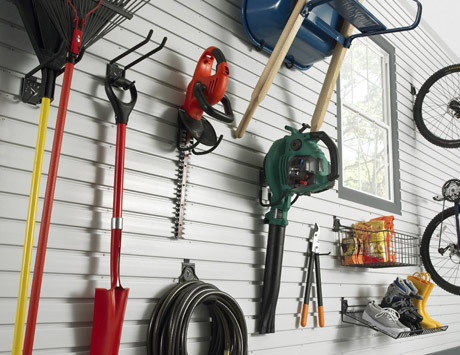 Gladiator® garage storage products combine limitless storage possibilities with sophisticated design to help you reclaim valuable space throughout your garage and home. The products are designed with flexibility in mind so your storage can easily adapt to your family’s changing needs. The system provides unlimited configuration options to store your gear and keep your garage tidy, no matter what your family puts in there. Strong and durable, Gladiator products will last the test of time and NZ’s harsh conditions. A wide range of Gladiator hooks, baskets and wall accessories provide the perfect way to store any item in your garage, or other room in your home. iPower are experts in Gladiator products so we can come to your home to advise on what solution will work best for you and provide a quote. iPower can install Gladiator for you for a professional finish, or it can also be self-installed. Gladiator products are strong and built to last. Choose Gladiator storage products for your garage and home storage solution to give you peace of mind and flexibility over time. Gladiator’s GearWall and GearTrack provide a strong and flexible foundation for your storage accessories. GearWall and GearTrack get securely attached to the wall. A wide range of hooks, baskets, and accessories can then be clipped onto the GearWall and GearTrack to provide unlimited storage options. The system is designed to be easy to add or move the wall accessories around, so your storage can change and adapt to match the changing needs of your family. Gladiator products make it simple to get your gear off the floor and safely out of the way on the walls.